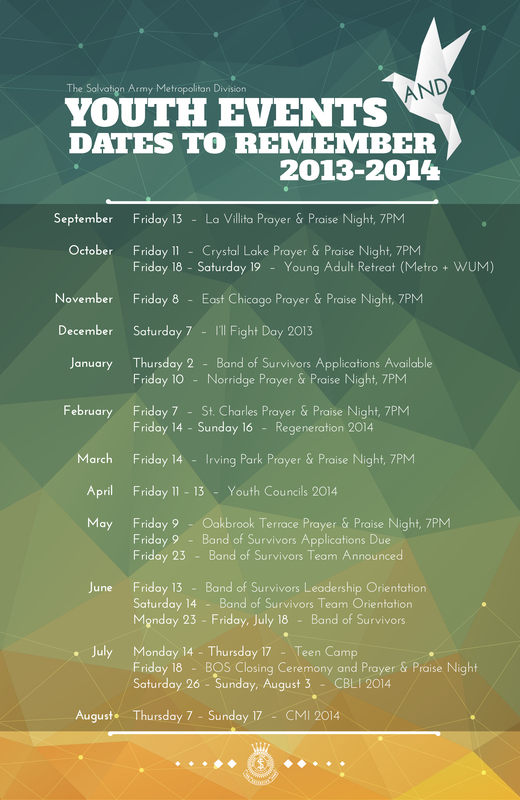 Check out the '13-'14 Metro Youth Dates to Remember Poster! | Metro Youth Network | Connect. Experience. Grow. Home » Band of Survivors » Check out the ’13-’14 Metro Youth Dates to Remember Poster! We in the Youth Department are extremely excited for an exciting year of awesome Divisional and Territorial youth events and experiences. Prayer & Praise Nights, Youth Councils, the Young Adult Retreat, I’ll Fight Day and more are all part of this year’s calendar. To get the word out, and to get everyone pumped, we’ve created a very cool 2013-2014 Metro Youth Dates to Remember poster (pictured above). With this poster, you will be able to have all of the dates and locations for various events at your fingertips, and will be proud to hang this up at home or school. 1. We will be distributing them at the La Villita Prayer & Praise Night on 9.13.13, and will continue to make them available throughout the year at P&PN’s, Youth Councils and other events. 2. Click on the poster above to download a digital copy. If you go to our website or the Divisional Bulletin Board, you’ll be able to download a digital copy of the poster for you to use in PowerPoint or other digital means at your Corps. ← Check Out The New Worship Resources (w/ Spotify Playlist)!